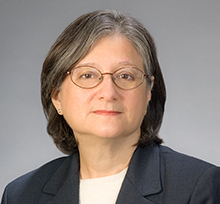 Elizabeth Ritvo has more than 30 years of broad experience in complex commercial litigation and has also counseled and represented newspapers, television stations, publishers and other media in libel, invasion of privacy, access, prior restraint, First Amendment and copyright matters before state and federal trial and appellate courts. Liz has also served as an arbitrator for the American Arbitration Association for business and construction disputes. Liz has been listed in The Best Lawyers in America in the area of First Amendment Law, was recognized as its 2017 “Lawyer of the Year” First Amendment Law in Boston and was named one of 2013's Top Women of Law by Massachusetts Lawyers Weekly. Worman, et al. v. Healy (Attorney General U.S. First Circuit Court, No. 18-1545). Co-counsel for faith-based organizations on amicus brief supporting the Commonwealth and urging the Court to affirm District Court’s decision upholding Massachusetts Assault Weapons ban. Committee for Public Services, et al. v. Attorney General of Massachusetts et al., 480 Mass. 700 (2018). Co-counsel for the Boston Bar Association on amicus brief in a case involving appropriate judicial measures to address prosecutorial misconduct in Amherst drug lab cases. Bridgeman v. District Attorney for the Suffolk District, et al. 476 Mass 298 (2017). Co-counsel for the Boston Bar Association on amicus brief urging the court to vacate all outstanding drug convictions for which state drug-lab employee Annie Dookhan was the primary or secondary chemist. Billingslea v. Commonwealth of Massachusetts (SUCV 2010-10103). Represented newspaper in gaining access to exhibits in sexually dangerous person civil commitment proceedings where the Superior Court found these were judicial records available for public inspection. LaChance v. Boston Herald, et al., 78 Mass. App. Ct. 910 (2011). Defended newspaper in defamation case where Appeals Court made expansive application of limited purpose public figure status to plaintiff inmate. Grant of summary judgment affirmed. Monahan v. The Boston Herald, Howard L. Carr and O’Ryan Johnson, (Mass. Superior Court, MICV 2006-03222). Defended newspaper, its columnist and its reporter in defamation case brought by former city selectman and chairman of state Civil Service Commission. Summary judgment granted on grounds that publications were either protected opinion, substantially true or published without actual malice. Safe Haven, et al. v. Charles “Chuck” Turner, Diane Wilkerson, Boston Herald, Inc., Robert Brown and City of Boston Inspectional Services Department, (Mass. Superior Court, SUCV 2007-02247). Defended newspaper in defamation case brought by operators of sober housing against the newspaper, a city councilor and a state senator, among others. The court noted that defense of defamation claims comes at significant cost to the institution of the press and thus that courts take a more liberal position with respect to motions to dismiss in this context. Motion to dismiss allowed. Commonwealth v. Entwistle, (Mass. Superior Court, Framingham Division, No. 0649-CR-0512). Represented newspaper in unsealing search warrant papers in connection with defendant Neil Entwistle and the murder of his wife and child. Islamic Society of Boston, et al. v. Boston Herald, Inc. et al., (Mass Superior Court, SUCV-05-4637). Defended newspaper against defamation claim brought by Islamic Society of Boston against client newspaper and others. All claims dropped and case dismissed with prejudice. Meuse v. Fox Television Stations, Inc., et al., 2008 WL 2228865 (Mass. Super.). Defended television station in defamation case brought by father who was focus of nationwide manhunt, after he disappeared with his daughter in custody dispute and was subject of television broadcast. Summary judgment granted on all counts. Yohe v. Nugent, et al., 321 F. 3d 35 (1st Circuit, 2003). Defended newspaper in defamation case in which First Circuit adopted a favorable, in-depth analysis of the Massachusetts privilege for fair reports of governmental activity. Grant of summary judgment affirmed. Unsealed pleadings in church sexual abuse cases in Massachusetts state courts. The Boston Herald v. Sharpe, 432 Mass. 593 (2000). Represented newspaper in unsealing judicial records in a case in which Supreme Judicial Court of Massachusetts recognized that public right of access to judicial records in civil cases is substantially the same as the broad right of access to judicial records in criminal cases. Peckham v. Boston Herald, Inc., 48 Mass. App. 282 (1999). Defended newspaper in invasion of privacy case in which Massachusetts Appeals Court recognized that the media are privileged against claims for invasion of privacy when a publication falls within a broad category of matters of “legitimate public concern.” Grant of summary judgment affirmed. Sprint Spectrum L.P. v. Town of Easton, 982 F. Supp. 47 (D. Mass. 1997). Represented major telecommunications carrier where court found that town violated Civil Rights Act, 42 U.S.C. 1983 by denying carrier its rights under the Telecommunications Act of 1996. Summary judgment granted and injunction entered directing town to issue special permit for construction of telecommunications tower. Rielly v. News Group Boston, Inc. et al., 38 Mass. App. Ct. 909 (1995). Represented newspaper in defamation case brought by daughter of president of union where Appeals Court found phrase “on the pad” had to be considered in context of entire article and, in context, was not capable of defamatory meaning. Grant of summary judgment affirmed. Boston Herald, Inc., et al. v. Superior Court Department of the Trial Court, 421 Mass. 502 (1995). Represented newspaper in matter involving access to hospital arraignment in which Supreme Judicial Court recognized that the public right of access to judicial proceedings was the same, whether proceedings were held in traditional courtroom or in non-traditional settings. Milgroom v. News Group Boston, Inc., 412 Mass. 9 (1992). Defended newspaper in defamation case brought by state judge where plaintiff failed to establish actual malice. Grant of summary judgment affirmed by Supreme Judicial Court. Selected by her peers for inclusion in The Best Lawyers in America© in the fields of First Amendment Law and First Amendment Litigation (2009-2019) and as its 2017 “Lawyer of the Year First Amendment Law in Boston"